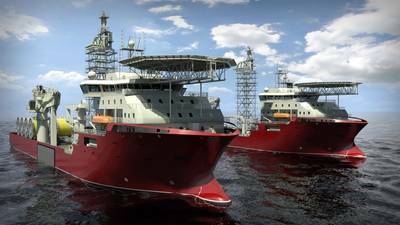 ABB wins $18 million order for subsea pipeline construction vessels. Zurich, Switzerland, May 16, 2012 -- ABB, the leading power and automation technology group, recently won an order worth $18 million from Daewoo to supply energy efficient propulsion and electrical power systems for two new deep sea pipeline installation vessels that will build oil transport infrastructure off the coast of Brazil. The order was booked in the first quarter. South Korean shipyard Daewoo Shipbuilding and Marine Engineering (DSME) will build the vessels. The end customer, a joint venture between French oil service company Technip and Brazilian company Odebrecht Oil & Gas, will use the vessels to connect subsea wells with floating installations in depths of up to 2500 meters along the coast of Brazil for oil company Petrobras. Wärtsila Ship Design developed the new VS 4146 PLV design with a solid tension capacity of 550 metric tons, and designed for optimal fuel consumption and flexible pipe laying operations. ABB’s delivery will help the vessels use less fuel while operating at the highest levels of efficiency. ABB will supply drives, motors and generators, medium voltage switchgear, transformers and softstarters that will provide energy efficient propulsion and a reliable power distribution system on board. In addition, ABB will take full project responsibility and do complete engineering for its own scope of supply. The diesel electric propulsion system will significantly reduce fuel consumption compared to traditional diesel mechanical systems. The heart of the propulsion system is ABB's propulsion drives, which are designed for optimized control of the propulsion motors, contributing to reduced fuel consumption and lower emissions. The two identical vessels will be delivered in 2014.